This is the latest CD (just released!!!! April 22, 2008) by composer and instrumentalist, Kevin Ferguson (See below for track details, audio samples, digitial downloads, ordering information, reviews, performance dates, how to get on the mailing list and sheet music transcriptions). 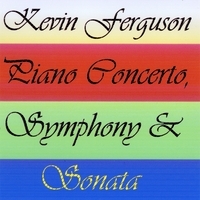 Ferguson's latest CD release, "PIANO CONCERTO, SYMPHONY & SONATA," is his debut as a classical composer. Ferguson's music in total is a collection of experiments in the possibilities of music from throughout history and the world. Every new tune is an experiment with something new learned and expressively explored. In this body of orchestral work, this wide range of expression is sometimes contained within the traditional structure of classical music, and sometimes bursts out on it's own. Click Here for Kevin Ferguson's performance dates.